We are QTF Services, a forward thinking and leading Timber Frame company with a manufacture factory based in Northern Ireland and regional offices in London and Glasgow. We manufacture and erect Timber Frame kits for a large segment of the UK and Ireland construction market and also produce kits for self-builds. QTF Services have more than 15 years combined experience within the timber frame industry and consider ourselves as leaders in our field. Not only do we manufacture, produce, deliver and erect timber frame kits for our clients, but we also offer design solutions, building experience and expert advice. At QTF Services, we set out to differentiate ourselves by virtue of the high quality material and workmanship utilised, in 2016 we were award an Investors in People award for our commitments to our dedicated timber frame team. We have also been award and accredited for the quality of our services from numerous leading timber frame associated bodies (See here) which demonstrates our commitment to producing the highest quality timber frames within the UK and Ireland. Once we receive your house plans we provide a quotation based on the services you require. You are advised at all stages of the process, starting with the provision of sample designs, foundation preparation and systems – based drawings, right through to the magic turning of the key. All this can be achieved in an extremely short space of time. Once approval is completed the timber frame kit can be manufactured within a number of weeks and is then transported and erected within 3-5 days. Proprietor Raymond Moan has been running QTF Services for over 10 years with extensive experience, background and knowledge within the timber frame, joinery and construction industry. Raymond’s aim was to help clients build their dream homes and encourage others to wake up to the exorbitant annual costs of home running costs when it came to concrete and block builds. His aim was to build a timber frame company that could exploit the huge benefits of a thermally efficient and ecologically sustainable home, resulting in huge savings for home owners, which is provided when you choose a timber frame, build for your dream home or property development. 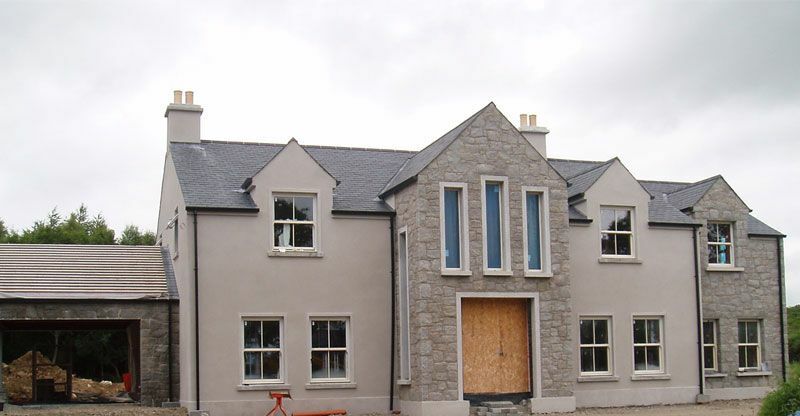 Following his approach to excellent quality, management and delivery, QTF Homes have been used by a high percentage of clients, new build homes and developments across the North and Republic of Ireland, with extensive work being completed throughout the mainland UK in recent years resulting in the expansion of two UK mainland sales offices in London and Glasgow. In addition, Raymond and his company work closely with the most forward thinking architects wanting to use QTF timber frame kits to bring their designs to life.